A court in Vietnam has sentenced six democracy activists to up to six years in prison for "spreading propaganda" against the government. The six men are the latest to be tried in a clampdown that has seen dozens investigated or arrested for alleged anti-government activities. Earlier this week, three people were sentenced to three to four years in jail for propaganda against the state. Other well-known dissidents, including lawyer Le Cong Dinh, await trial. The two-day trial of Nguyen Xuan Nghia, Nguyen Van Tinh, Nguyen Kim Nhan, Nguyen Van Tuc, Ngo Quynh and Nguyen Manh Son took place in the northern port city of Haiphong amid tight security. They were accused of hanging political banners, distributing leaflets and disseminating anti-government materials via the internet. Their banners bore pro-democracy slogans and were hung in August last year over a bridge on the Hanoi-Haiphong highway. All of them were arrested in September 2008. 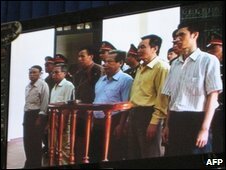 The men were also accused of being associated with Bloc 8406, a pro-democracy network inside Vietnam. The prosecutors said their actions were "harmful to national security". Their sentences ranged from two to six years in prison. Writer Nguyen Xuan Nghia, 60, considered the leader of the group, received the harshest sentence: six years in prison plus four years of house arrest. He was accused of receiving money from "reactionary sources overseas" to "organise anti-government activities". Only his wife, Nguyen Thi Nga, was allowed inside the courtroom to witness the trial. She told BBC she was "outraged" by the verdict. "This is cruel and totally ridiculous. My husband is an innocent man and he only wrote the truth," she said. Families of the accused said they would appeal against the sentences. 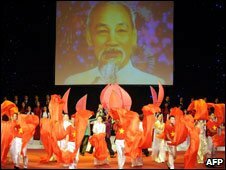 Observers say Vietnam is tightening up security ahead of the next Communist Party congress, to be held in early 2011.